Fashion trends and fashion models Muslim hijab for women not only happen in Indonesia. In many countries, many fashion designers or creative young woman who not only look shar'ie, but also fashionable. In a country with a Muslim population slightly, stretching or hijab Muslim fashion trends also increased, one of which is the Russian state. Islam is the second most widely adopted in Russia after Orthodox Christianity. There are around 21-28 million people, or 15-20 percent of the approximately 142 million inhabitants. Islam is regarded as one of the traditional religion which is a historical heritage of Russia. Muslims in Russia now have a better life than the first communist era. Currently there is even a Muslim religious minister. 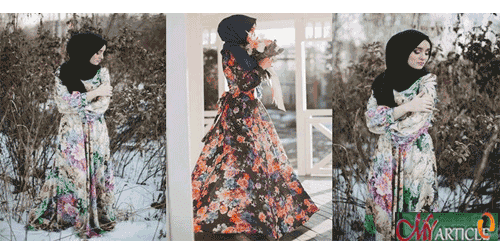 Taking inspiration from a simple Turkish style became one of the mainstays of the hijabers Russia in 2015. Model veil or display babushka Russian woman is also a favorite. Babushka is derived from the Russian word that means the oldest woman. In 1970, Russian women who are elderly generally uses rectangular scarf to cover her head. Since then, the veil as simple as Russian woman called babushkas. Application hijab babushka only use one to two simple steps make the appearance looks simple, minimalist and elegant. Suitable for a professional look. The style is now becoming a trend among hijabers the past two years, especially after some Muslim fashion designer hijab style babushka tucking in his latest collection. Hijabers origin Moscow, Russia, Alexandra Golovkova (19) seems happy to look stylist and simple to wear boots or lace-up shoes. Clothing colors also tend to monochrome. Here's fashion style beauty Alexandra.